Every organization needs to understand who their target audience is, in order to know how to direct their activity and through this, define their strategy and lines of action. In the case of museums, the analysis of their visitors and their behavior, likes and preferences is important, since it helps the museum to understand their profiles and interests, and to help define their activity. In this post, we reveal the recent collaboration between Synergic Partners, the area of analytics and consultancy at LUCA, and the Reina Sofia Museum in Madrid, the first Big Data study carried out in Spain. Figure 1 : A view of the exterior of the Reina Sofia Museum in Madrid. The exposition titled "Pity and Terror: Picasso's Path to Guernica" has been open in the Reina Sofia Museum for the last five months, coinciding with the 80th anniversary of Guernica's creation by Pablo Ruiz Picasso in 1937, and the 25th anniversary of this painting's arrival in Madrid. Normally when we buy an entry ticket for a museum or exposition, we will be asked where we come from, if it is our first visit or our reason for visiting. All this is done in order to produce internal statistics and to help the museum to understand the atendees. 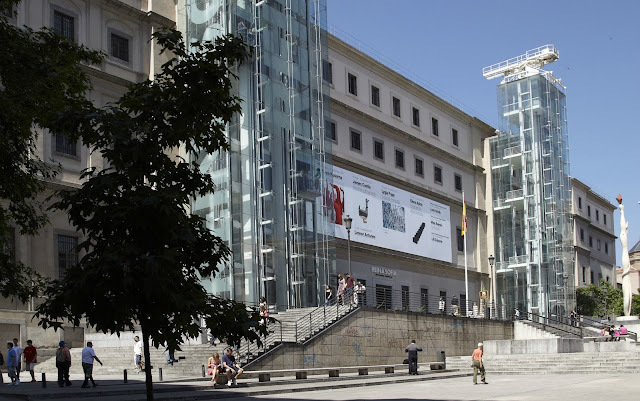 However, the Reina Sofia Museum in Madrid wanted to go one step further and has become the first museum in Spain to carry out a Big Data study which can be used as a basis for undertaking a more comprehensive analysis. According to Carme Antigas, cofounder and CEO of Synergic Partners and author of the study, "Big Data is the ability to be able to process large volumes of data, to analyze this data and to extract behavior patterns that allow us to predict what is going to happen". The analysis in this case has generated the "enormous quantity" of 157 gigabytes of information. "The complete works of William Shakespeare total 5 megabytes. We are talking about an amount that is 30,000 larger than the works of Shakespeare", she explains. Thanks to the large amount of data generated through the Big Data study carried out, the Reina Sofia Museum is able to determine the behavior of the general public that has visited the exposition. They can work with different sources of information, including those from the Museum's own activity, external sources and those totally independent of the visitors' activity such as meteorological data, live tracking of social networks, festival calendars and mobility data. On this occasion, the Smart Steps solution has been used to make the most of mobility data. According to Manuel Borja-Villel, the museum's director, "it is important to understand this data in order to make the visit as pleasant as possible". 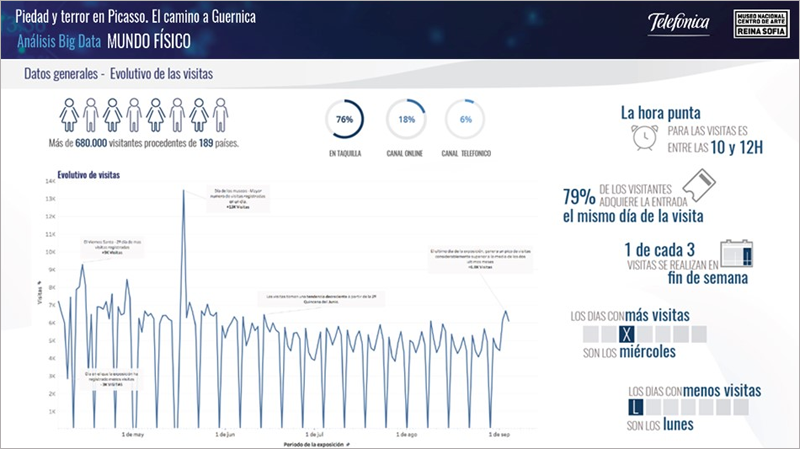 Figure 2 : Data about the profiles and behavior patterns of the visitors to the exposition. Many factors have been taken into account during this study, including the tourism that occured during these months in Madrid, major events that had taken place, the weather and even financial transactions, In this way, they have been able to include that, for example, of those tourists that had been in Madrid during this five-month period, 11.5% visited the Reina Sofia Museum. The peak time was during 10 and 12 o'clock, the most popular day to visit was Wednesday and the least popular was Monday. Furthermore, applying this analytical study carried out by Synergic Partners has also revealed that the 680,000 peaople visited the exposition from 189 countries, with an average of 4,800 daily visitors. Over 60% of the visitors were from abroad and among them the most common countries of origin were Italy (17% of the total), France (11%), Germany (7%), the US (7%), Great Britain (5.6%), Japan (1.4%) and Portugal (1.3%). For the museum, it is also interesting to understand the behavior patterns of these visitors. It can be seen in the study, among other things, that extreme weather conditions led to an increase in visitors, both for rain and sudden drops in temperature during the warm months. For example, on the 4th and 5th of June, there was a significant fall in temperatures, and this resulted in a 33% increase in visits to the museum. Another significant piece of information is that 79% of visitors acquired their entry ticket of the day of visiting, and that an individual would spend, on average, an additional 5 euros in the area around the museum. Thus, the exposition become one of the catalysts of economic activity in the vicity, with an 18% increase compared to the previous trimester.